In the past year the "religious right" that supported Trump has lost any claim to morality or decency. I fully expect a new printing/updating of the Bible explaining how "a man with tiny hands and a large Twitter account shall lead you." 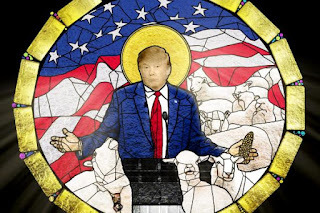 Somehow good Christians got lost, and when they saw the Orange One glowing on TV and promising to bring Christmas back they took him as their new Messiah. How can a religion that prides itself on obeying the 10 Commandments support a known liar, adulterer, and someone who is a billionaire narcissist lusting for wealth? I'll never figure that one out. Trump is a demagogue whose god is money. Trump Tower - aka the Tower of Babylon - is a monument full of idols (Trump photos) and golden statues. As Trump's god is money, it automatically disqualifies him as a God-loving Christian, and someone who cares about swearing. Nothing in Trump's entire history indicates he's ever considered the Sabbath day a time to reflect on God. More like it's been a favorite day to golf. If following in your father's greedy ways is honoring him then Trump is not guilty of violating this command. There's no proof Don the Con ever murdered anyone...yet. Chump really rings the bad bell on this one having cheated on his first two wives. If cheating can be equated to stealing (and I think it is) Trump has spent a lifetime practicing the foul art of the ripoff. A quick examination of Trump's shady deals include attacking anyone living near a Trump golf course (think Scotland) who complains. His battery of crooked lawyers regularly lie their asses off for him and attack his neighbors. With his finely honed greed guiding him, Trump has repeatedly coveted land and businesses, taking them over by whatever means presented themselves. All Aboard The Greed Train!